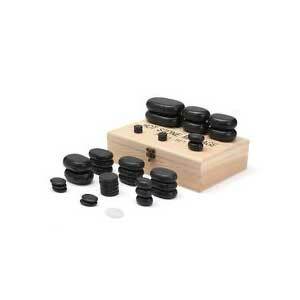 Create the perfect massage experience for your spa guests with the 45-piece Polish Stone Set. For only a small amount more than the 36-piece stone set, you?? ?ll receive additional stones in extra sizes to fit specific areas of the body. This set includes the small, medium and large stones found in the 36-piece set, which are intended for the face, neck, arms, hands, legs and back. In addition, you get one extra-large stone for the stomach area, two pressure point stones for the neck and back, two eye stones, two marble stones for cooling and eight stones for the toes. This set creates an entire body experience. Each stone is created from natural basalt into a flat, oval rock that perfectly sits on the body to add heat and relaxation to any type of massage. The stones come in a bamboo box. Enhance your spa?? ?s massages by ordering these stones today.